Nathaniel BASSETT Sr. (1628 – 1709) was Alex’s 9th Great Grandfather; one of 1,028 in this generation of the Shaw line. Nathaniel Bassett was born in 1628 in Plymouth, Plymouth, Mass. His parents were William BASSETT and Elizabeth [__?__]. He married Dorcas JOYCE 1672 in Yarmouth, Barnstable, Mass. His wife Hannah, who died in 1709, was probably a second wife. The record of his family is lost. Nathaniel died 16 Jan 1709 in Yarmouth, Barnstable, Mass. Dorcas Joyce was born in 1644 in Lynn, Essex, Mass. Her parents were John JOYCE and Dorothy COTCHET. Dorcas died 12 Nov 1709 in Yarmouth, Barnstable, Mass. 27 Feb 1707 Yarmouth, Barnstable, Mass. 3 Dec 1719 Yarmouth, Barnstable, Mass. 6 Jan 1750 Yarmouth, Barnstable, Mass. 23 Feb 1710 Yarmouth, Barnstable, Mass. 2 Mar 1651/52 – “Nathaniel Basset and Joseph Prior, for disturbing the church of Duxburrou, on the Lord’s day were sentenced each of them to pay twenty shillings fine or the next towne meeting or training day both of them to bee bound unto a post for the space of two hours, in some public place, with a paper on their heads on which theire capital crime shall be written perspecusly, soe as may bee read.” Whether they paid the fines imposed or suffered the novel mode of punishment to which they were sentenced does not appear. Nathaniel first settled in Marshfield, but removed to Yarmouth where he was an inhabitant in 1664, and perhaps earlier. He resided near the first meeting house and his descendents still enjoy his lands. Notwithstanding the trifling irregularity in his conduct when a young man at Duxbury, he was a very worth and respectable citizen, had a large family, ten of whom lived to mature age. Nathaniel’s will, dated 10 Jan 1709/10, six days before his death, is a carefully drawn instrument, witnessed by Rev. Daniel Greenleaf, Experience Rider, and his nephew Col. William Basset, and furnishes much genealogical information. He names his nine children then living, says he is “aged and under much decay of body,” being then 82 years of age. To his son William he gave meadow and upland, which was John Joyce’s drying ground, bought of Mr. Thomas Wally, and meadow bought of Mr. Thornton. Estate appraised at £228,11. Though William is first named in the will, he was probably the youngest son. Nathaniel’s wife Joannah Borden was born about 1670. Joanna died 03 Dec 1740 in Mansfield, Connecticut. Nathaniel was one of the incorporators of the town of Mansfield in 1703, a town in Tolland County.The population was 20,720 at the 2000 census. Mansfield was incorporated in October 1702 from the Town of Windham, in Hartford County. When Windham County was formed on 12 May 1726, Mansfield then became part of that county. A century later, at a town meeting on 3 April 1826, selectmen voted to ask the General Assembly to annex Mansfield to Tolland County. That occurred the following year. The town of Mansfield contains the community of Storrs, which is home to the main campus of the University of Connecticut. Thomas and Mary were original settler in Truro, Mass, a town in Barnstable County, comprising two villages: Truro and North Truro. Located two hours outside Boston, it is a summer vacation community just south of the northern tip of Cape Cod, in an area known as the “Outer Cape”. English colonists named it after Truro in Cornwall. The historic Wampanoag Native American people called the area Pamet orPayomet. Their language was part of the large Algonquian family. This name was adopted for the Pamet River and the harbor area around the town center known as the Pamet Roads, The population of Truro was 2,087 at the 2000 census. Over half of the land area of the town is part of the Cape Cod National Seashore, established in 1961. The English Pilgrims stopped in Truro and Provincetown in 1620 as their original choice for a landing before later deciding the area to be unsuitable. While there, they discovered fresh water and corn stored by the Kakopee. Historians debate the accuracy of the account about the latter discovery, but in popular lore it led to the place being called Corn Hill. Truro was settled by English immigrant colonists in the 1690s as the northernmost portion of the town of Eastham. The town was officially separated and incorporated in 1709. Fishing, whaling and shipbuilding made up the town’s early industry. These industries had to shift to other locations as the harsh tides of the Lower Cape began decimating the town’s main port in the 1850s. In the late 19th and early 20th century, Cape Cod was a popular location for artists because of its light. The records of the proprietors, distinctive from the records of Eastham, commenced in 1700, and in the meetings as recorded, and in the admission of freemen from time to time we find the following named persons were residents when the town was incorporated: Jedediah Lombard, senior [son of Thomas LUMBERT] and junior, Thomas Lombard, Dr. William Dyer, Benjamin Smalley, Thomas Newcomb [son of Andrew NEWCOMB Jr.], Isaac Snow, Jonathan Collins, Nathaniel Harding, Joseph Young, David Peter. John Snow, Constant Freeman, Thomas Paine, senior and junior, Nathaniel Atkins, Francis Small, Lieutenant Jonathan Bangs, John Rogers, John Steele, Thomas Mulford, Hezekiah Doane, Samuel Treat, jr., Hezekiah Purington, Humphrey Scammon, Beriah Smith, Richard Stevens, John Myrick, Moses Paine, Jonathan Vickery, Micah Atwood, Josiah Cook, Ebenezer Hurd, Samuel Small, Samuel Young, Jonathan Paine, Edward Crowell, Ebenezer Smith, Jonathan Dyer, John Savage, Israel Cole and Thomas Smith. Here lyes the body of Elder Thomas Mulford who died Sept ye 14th 1747 in the 82d year of his age. Nathan’s wife Mary Crowell was born 2 Dec 1688 in Yarmouth, Barnstable, Mass. Her parents were Thomas Crowell and Deborah [__?__]. Mary died 1742 in Chatham, Barnstable, Mass. Mary, daughter of Thomas Crowell of Yarmouth, He died in 1728, leaving seven children. 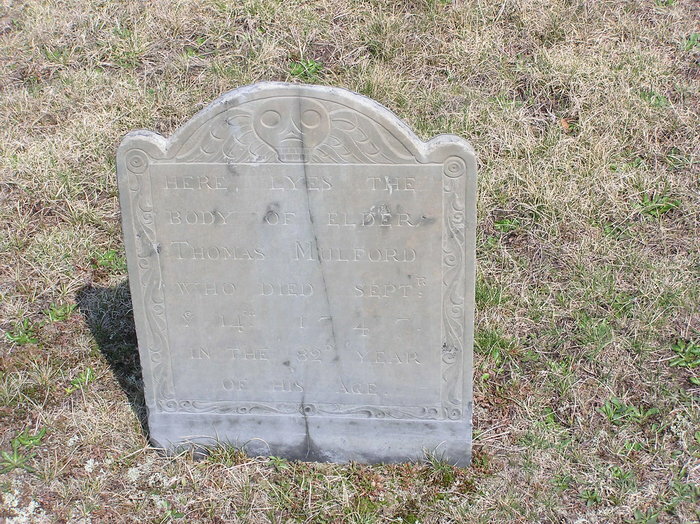 She died in 1742, and names in her will sons Nathan, Thomas, Nathaniel, who married Sarah Chase of Yarmouth, Aug. 23, 1729, Samuel, and daughters Mary Basset, Dorcas Nickerson and Hannah Co veil. 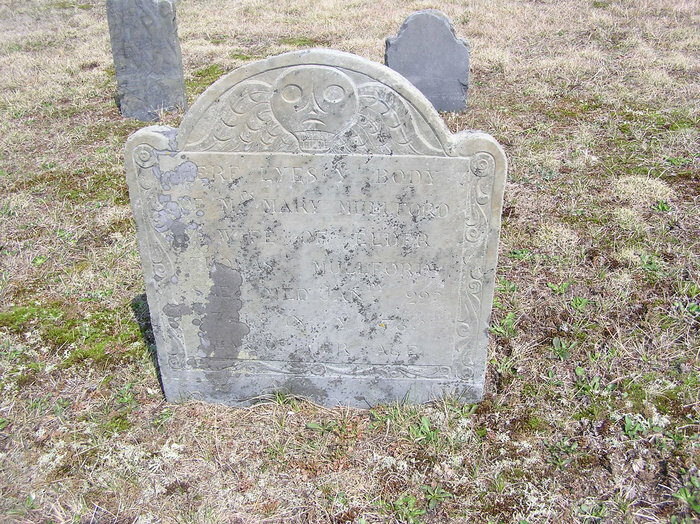 One of the oldest monuments in the Yarmouth graveyard is that of Dorcas Basset, who died June 9, 1707, aged 31. She was probably a daughter of Nathaniel. Hannah’s husband Joseph Covell was born 1675 in Chathamn (Monomoit), Barnstable, Mass. His parents were Nathaniel Covell and Sarah Nickerson. He first married Lydia Steward, daughter of Ensign Hugh of Monomoit, about 1700. She died not long after and he married second Hannah Bassett. Joseph died in 1732 in Chatham, Barnstable, Mass. Joseph’s farm was on the east side of Muddy Cove and extended east to the present road from the old cemeteries over to the lat Rufus Smith’s. It was part of the old Wiliam Nickerson farm. There is no record of his death or of his children and no settlement of his estate. He was living as late at 1732, but does not appear on the tax list of 1755. Sarah’s husband John Nickerson was born 1686 in Harwich, Barnstable, Mass. His parents were Joseph Nickerson and Ruhamah Jones. John died in 1722 in Harwich, Barnstable, Mass. 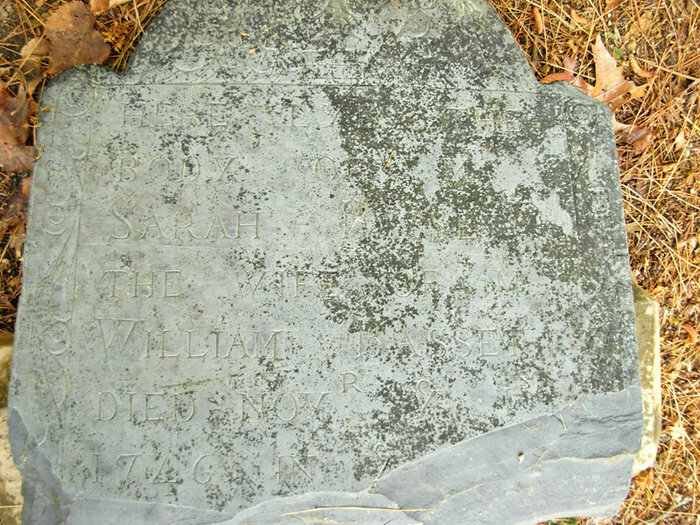 William’s second wife Sarah Jenkins was born 15 Nov 1693 in Barnstable, Barnstable, Mass. Her parents were John Jenkins and Mary Parker. William and Sarah were dismissed from the Yarmouth to the Barnstable Church, Aug. 1727. Sarah died 1 Nov 1746 in Barnstable, Barnstable, Mass. The findagrave researcher RColbath was just about to give up looking for Sarah’s headstone, when she spotted it laying on the ground, broken, near the edge of the cemetary. It’s difficult to read her last name, but the name Bassett is legible in her husband’s name. This entry was posted in 11th Generation, Line - Shaw, Twins and tagged Yarmouth. Bookmark the permalink.